Take a good look at the cat pictured here. What do you think? Oh sure, he looks nice. Handsome white paws. Carpet-like gray coat. He’s even approachable and vocal. All good qualities. But he’s also a menace to the micro-society of our yard. Gary, as we call him, has been hanging around for weeks. We thought he had a suitor’s interest in our fair Annie. On the few occasions where they met, with the screen door between them, the encounter did not go well. Not Annie’s type, it would seem. 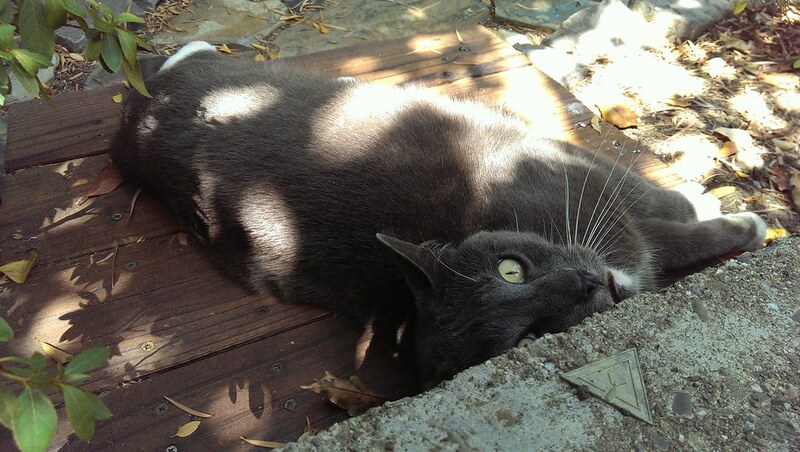 Still, Gary persisted lounging around the yard, hoping to win her favor. Or so we thought. Last weekend I was watching the many birds at the backyard feeder, and Gary was watching too. I was at the back door, he was way down in the corner of the yard. All quiet and peaceful, when he suddenly raced to the feeder and grabbed one of our nice Dark-eyed Juncos. No! He slithered away with his prize, the now lifeless Junco. Disaster. How long has this been going on? I have had the two feeders out there forever, attracting multitudes of good little birds. Now I felt like an unwitting accomplice to Gary’s crimes. The feeders came down immediately, confusing our winged friends. They rested on the nearby trees, their little foreheads furrowed. One fluttered in mid-air where the feeder once was. Soon enough, they were gone. I hated to see them go, but it was for their own good. I was going to have to take the feeders down anyway, because I saw a House Finch with conjunctivitis out there earlier in the day. You want the finches to disperse if you notice one with an eye problem, as they like to crowd together and your feeder can aid in spreading this bug. But now I’ll need to keep them down until Gary finds somewhere else to prey on birds. He’s still out there, every day when we get home from work. Waiting. The Resident Expert calls him the Gray Ghost. I know that not everyone thinks feeding wild birds is such a hot idea. Others say that it’s a fine pursuit, causing no deliberate harm. But this episode has brought the issue into stark relief. We’ve removed the birds natural habitat, shouldn’t we provide some dependable food supply to compensate? Let’s accept that we should. But is a fixed, artificial bird feeder the best way to fill in the gap? Not so sure about that. What we’re aiming for now is to create a bird-friendly habitat with plants. We’re on that track already, but still have a lot of plants that were selected for decorative purposes. To get in the yard now you’ll have to offer nectar, produce nuts, set seeds, provide shelter, generate leaf litter, or do something else that birds (and bugs and reptiles) are looking for. This will take some time, but fortunately the drought is killing all of our decorative plants and that will make room for the hard-working habitat plants. It’s already starting to work out in the front yard, which started its transformation last fall. The morning after Gary’s slaughter of the Junco, I sat out there with my coffee, and saw the Junco, Towhee, Hummingbird, and others moving through. Nothing like the concentration we would see at the feeders, but I realize now that was a distorted reality. My favorite kind. The feeders may come back in a month, as I’ve already signed up for Project Feederwatch. Sort of depends on whether Gary is still surveilling. Is he really “public enemy number one”? We took cats out of the wild, valuing their hunting skills, and now we want them to stop doing that. I can’t really blame the little guy, even though I’m still mad at him for the unnecessary killing of the Junco. He’s hardwired to do this. 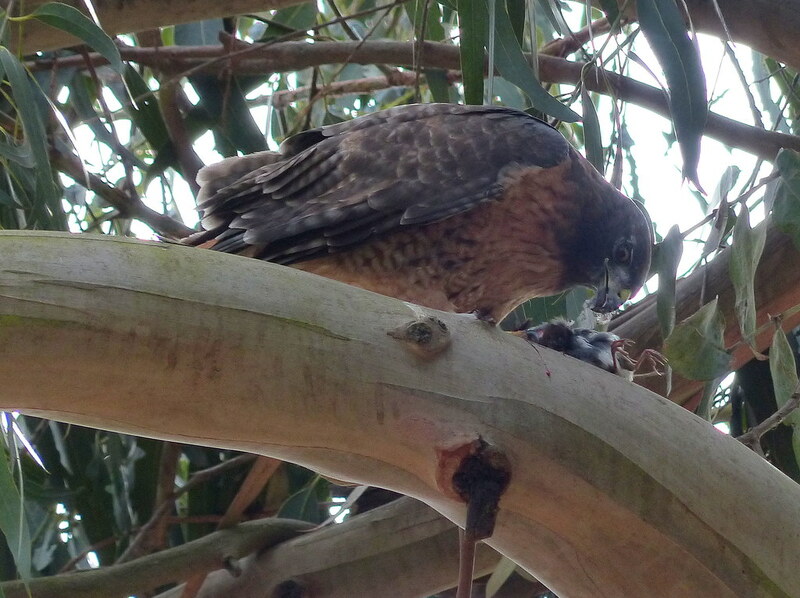 And he’s not the only one – take a look at this Red-tailed Hawk chowing down on a songbird. I’m going to keep trying to draw birds into our little yard, where they are trading safety for a regular food supply. With the habitat plan I can mitigate this risk to the birds. We’ll figure this thing out. One side benefit has already emerged; the area underneath the feeders is recovering from the nonstop trampling of the squirrels.